I have good news, and I have bad news. Fortunately the good news is very good, and the bad news is really not all that bad. The bad news: Porsche didn't launch a single unique new model at the New York International Auto Show(NYIAS). All four models are cars we knew about from prior shows and releases. The good news is that all of these models are exciting additions to Porsche's North American lineup which offer new levels of performance and personalization to the Porsche range. New York saw the North American debuts of the Panamera Turbo S E-Hybrid and Sport Turismo, 911 GTS and 911 GT3. As most of these models are familiar to our readers, let's talk about the New York International Auto Show as a whole before we get into these models in a bit more depth. Those people are mini-Minifigures, and this is still a very large model. The Javits Center is massive and, unlike the model above, is exclusively made of materials other than Lego. The exhibit space totals some 840,000 square feet, and the high ceilings are studded with bright, harsh lights illuminating the show floor. In general mass-market brands(Ford, Chevy, Toyota, Lexus, Volkswagen and Nissan) are closer to the entrance. More niche brands, including Porsche, Jaguar-Land Rover and Maserati are positioned closer to the exits. Previewing the Alfa Romeo Stelvio with a selfie stick. "Press" is pretty all encompassing. In addition to folks like myself from automotive websites and publications, the attendees on the two designated press days ranged from the Associated Press to every sort of blogger and Youtuber you can think of. The diversity and occasional weirdness of digital content made for some odd sights as Youtubers made content for their channels. That said, the halls seemed fairly empty compared to a normal public day. The Dodge Demon: The only car at the show displayed on a kickstand. There were surprisingly few major debuts at the NYIAS this year. Arguably the two most important new, never-before-seen in public cars were the Dodge Challenger Demon, pictured above, and the Volvo S90. The former is now the fastest and hardest accelerating production car(1.8G of acceleration), and the only production car able to pull a wheelie from a standing start. The latter is Volvo's best full sized luxury sedan to date- launched one day before the 90th Anniversary of Volvo's first car rolling down the production line. Lincoln showed their new Continental, which is the brand's first unique model in many years. I appreciated it its 30-way power adjustable, massaging barcaloungers tremendously after two days walking the show floor. There were four Porsche models shown for the first time in the North American market at the show, all of which we have featured previously. Above is the Panamera Turbo S E-Hybrid, now the most powerful Panamera in the range. For the first time in Porsche's history a model's hybrid variant will sit atop the range, and it's truly an impressive vehicle. The E-Hybrid takes the Panamera's impressive range of technology and integrates it with a hybrid system that makes it the fastest and most efficient V8-powered Panamera in the range. I will admit my biases: Of the four models debuted for North America, the 911 above captured my imagination the most. The GTS series joined the 911 lineup back in January, offering 30 horsepower more than their non-GTS siblings. This model has been available to the press for a few months, though this may have been its auto show debut. In my eyes, the GTS is the perfect street 911. All variants, both rear and all wheel drive, are based on the Carrera 4 S widebody shell, and share that car's 72.9 inch width. Coupled with the lowered PASM suspension which brings the car .5" lower than the standard Carrera, the GTS looks low, wide and intense. The example on the stand was finished in Guards red with black wheels and a satin black Targa bar over a black microsuede interior. You can take yours how ever you like, I'll take mine like this. 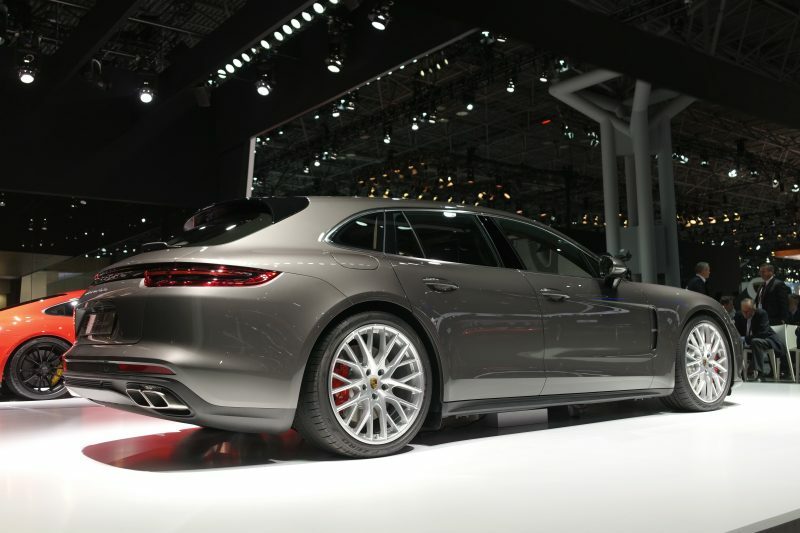 Not only is the Sport Turismo a wagon, it is the only Panamera with three across seating in the rear. Unlike most manufacturers Porsche has taken a very pragmatic approach to naming the middle rear seat. They refer to the Sport Turismo's standard rear seating as "2+1." Individually adjustable rear seats with no center seating position are available as an option. The Sport Turismo increases cargo space by 1.8 cubic feet with the seats up over the sedan, and offers up to 49 cubic feet of space with the seats folded. The engine range in the Sport Turismo is currently identical to the standard Panamera, with the omission of the Turbo S E-Hybrid model. For the time being that option is only available in the Panamera Sport Sedan. The 911 GT3(991.2) was, for many, the highlight of the show. A number of changes and updates are present on the 991.2 compared to its predecessor, including active rear wheel steering and an optional six-speed manual. The 4.0l naturally-aspirated flat six produces 500 horsepower and 339 lb.-ft. of torque, and is derived from the unit used in both GT3 Cup cars and the 911 RSR. With the six-speed manual fitted the latest GT3 weighs just 3,116lbs. This is 37lbs less than the PDK-equipped variant. The 991.2 features improved aero over its predecessor, with 20% more downforce for improved high-speed stability and a new rear diffuser for improved airflow of the back of the car. Active rear steering is making its debut on the 991.2 GT3. Other new features include a 14.1" steering wheel derived from the unit used in the 918 Spyder, and three optional seat types; Sport Plus, Adaptive Sport Plus, and height-adjustable fixed-back carbon fiber buckets. It says a lot about the other offerings on hand that the 580 horsepower Turbo S was positively overshadowed on the show stand. 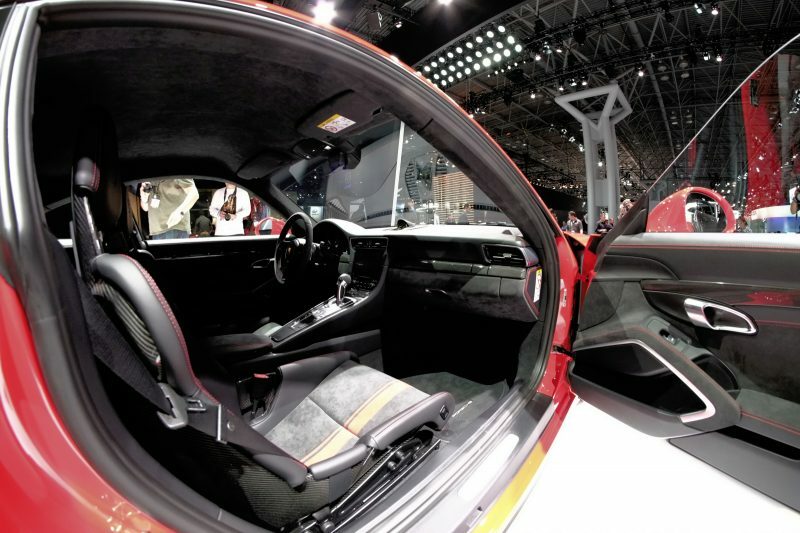 The New York International Auto Show is an odd thing, or at least it was this year. To the Porsche devout the new models may have been familiar, but they were certainly welcome. We're certainly eager to experience the new 6-Speed GT3 from behind the wheel, to say nothing of the other exciting new models.